Here’s another mare I coveted and have followed for years, ever since she was selected and sold in the Borculo auction in 1995. And, through the graciousness and generosity of Amy Sabino, Nemels ended up on our doorstep, literally. It would be hard to find a more proven mareline than this preferent-and-prestatie-laden bottom line in any KWPN horse, let alone a “platenbont”. Nemels herself will eventually be preferent and prestatie–she has a dozen offspring competing in dressage, jumpers, and eventing. As I mentioned, as a foal, Nemels was selected for the Elite Borculo Auction. Only the top foals out of the best marelines are selected for this auction. She went on to earn her ster predicate in the USA, making the top ten of her year, and successfully performed her IBOP to become a keur mare. Having gone through the same radiographs as an approved KWPN stallion, she is also elite. 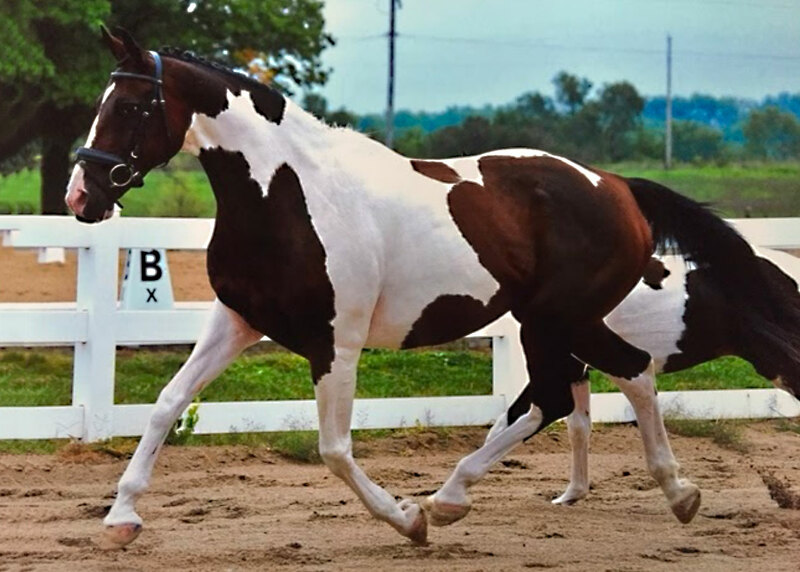 This mare’s pedigree, too, is a Dutch pedigree devotee’s dream. (Are you noticing a theme here?) Her sire, Samber, is the most famous progenitor of Pinto sport horses in the world. Nemels is one of his very best daughters. On the bottom side, her dam’s sire, Lector (also seen in Mistral’s pedigree), was a top producer of dressage horses in Holland. Behind him, there’s none other than the Stallion of the Century, Nimmerdor, who is known worldwide for producing top sport horses and being one of the most valuable names you can find in a KWPN pedigree. I am delighted that this mare made it to New Hampshire to end her breeding career. In 2015, she produced a gorgeous pinto colt by Governor, Katmandu SSF. Kat was purchased as a stallion prospect and future upper level partner by Kristina Cirelli. We tried multiple times to get Nemels to carry another foal, but to no avail. Kristina has leased her to make her own attempts.